Latest figures show that Fortnite mobile has surpassed 100 million downloads after being available for less than five months. 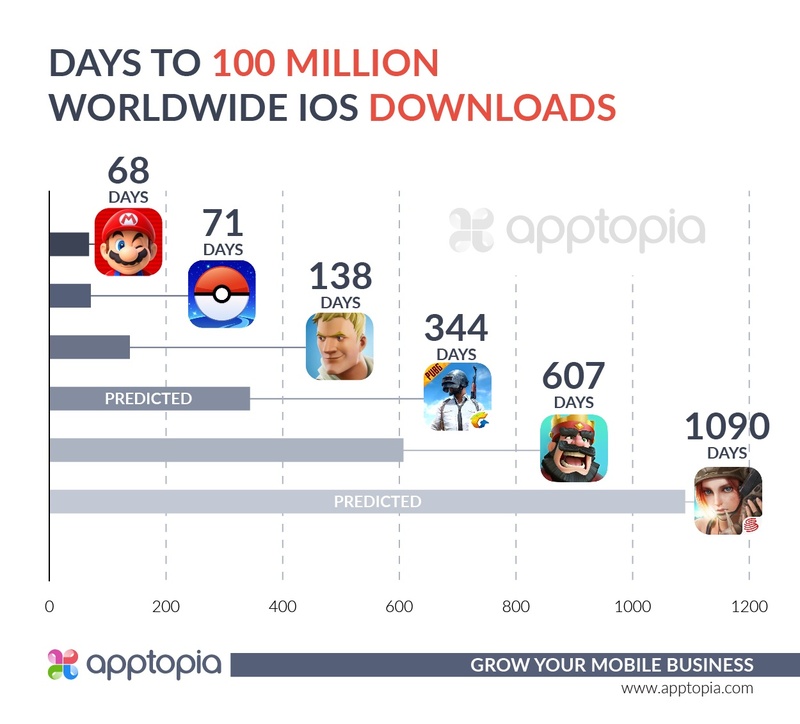 Figures from market intelligence firm Apptopia show that Fortnite mobile reached 100 million downloads in 138 days, despite only being available on iOS. Although Fortnite trailed considerably behind main rival PlayerUnknown's Battlegrounds during the early days on mobile -- with only 3.4 million first week downloads compared to PUBG's 23.3 million -- its main competitor isn't expected to reach the 100 million milestone for another 206 days. Since arriving on mobile in March, Fortnite has cleared $160 million in IAP revenue, and the game is on track to hit $500 million revenue by April 2019. According to Apptopia, players spent 2.7 billion hours playing Fortnite on mobile, with an average session time of 21.6 minutes, which comfortably beats out Pokémon Go's average session time of 14.8 minutes. Despite Fortnite's meteoric rise, it still took 60 days longer to reach 100 million downloads than Nintendo's least profitable mobile endeavour, Super Mario Run, a discrepancy which Apptopia communications lead and brand ambassador Adam Blacker describes as a "combination of advertising and timing". "Nintendo spent ample money on advertising and marketing efforts, including teaming up with Apple for prime App Store real estate in the week leading up to launch," he said. "Combine that with a heavy dose of nostalgia and the holiday bump mobile games typically receive in December, and we have a monstrous launch. "Keep in mind that Super Mario Run had a massive drop-off in velocity of downloads about a month after launch, whereas Fortnite and Pokémon GO have been able to sustain a consistent level of high downloads."